For the last few years, I have been collecting a range of stories about motherhood and how the experience of motherhood changes us. I’ve been especially drawn to those stories which we often don’t hear. Stories that involve challenges, require growth and deepen wisdom. When we are inside these kinds of experiences, there’s nothing more valuable, or needed, than hearing how someone else has managed and risen to the occasion. This story features a wise mother and dear friend, Erin Duffy, who generously shares their family’s story. This year, Erin and her husband Dennis’ seven-year-old daughter Embree, was diagnosed with acute lymphocytic leukemia, or ALL. 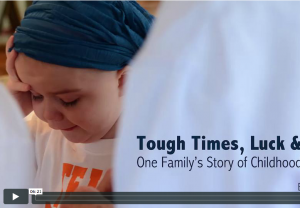 While Embree’s prognosis is very good, her treatment, which requires two-and-a-half years plus of extensive chemotherapy–demands more of this family than most of us will ever understand. Ogburn, with Dr. John Moses, directs the Documenting Medicine program at Duke University.